February 8, 2013 / P.J. Sure, a lot of disc golfers would probably say they would play 24 hours a day if they could. But if push came to shove, who would actually step up and do it? University of California, Santa Barbara freshman Mike Sale, for one. 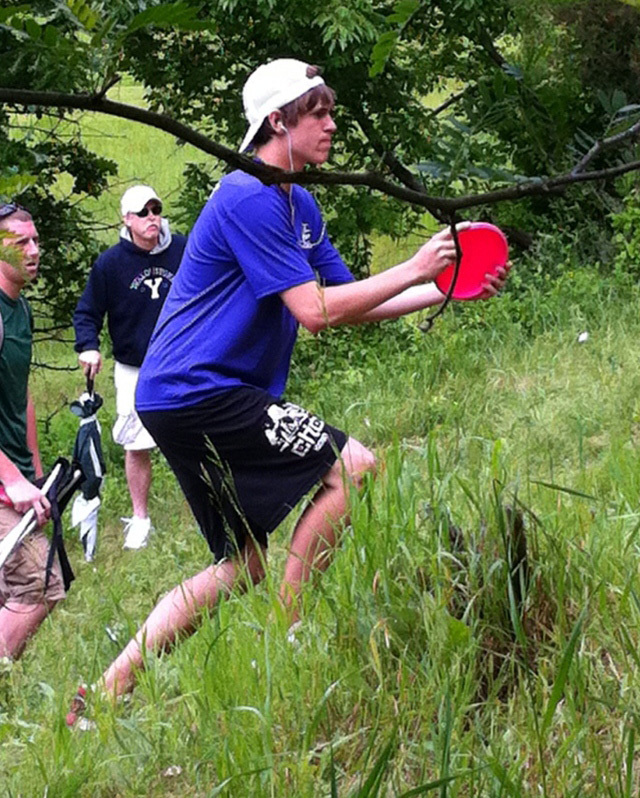 And he’ll also be attempting to break the Guinness World Record for most disc golf holes played in a 24-hour span. Mike Sale will attempt to set a Guinness World Record for amount of disc golf holes played in a 24-hour period. Sale, 18, will play disc golf from 9 a.m. (PST) Sunday to 9 a.m. Monday at the nine-hole Isla Vista Peace Course in Isla Vista, California. In order to break the record, he will need to play more than 1,305 holes. Beyond attempting a world record, the event is also a fundraiser for the UCSB disc golf team’s trip to the National Collegiate Disc Golf Championships April 4-7 in North Augusta, South Carolina. Sale founded the team this past fall. The team competed at last November’s West Coast College Open at Cal State Monterey Bay, qualifying for this year’s national championships. But, being a club team without major university backing has left the students looking for funds to make the trek east. In addition to disc sales, Sale said he thought the world record attempt would be an effective means to that end. “I chose this way because I figured, in a college setting, people would be more willing to donate and be super hyped if someone was trying to break a world record in their area,” he said. Sale, who double majors in psychology and economics/accounting, started an online fundraising campaign with a goal of $800. The money is slated to be used for travel, lodging, and other expenses on the trip. Along with teammates, Sale has been planning the event since October, and has gone to the lengths of acquiring permits and insurance with the city of Isla Vista to make sure everything is on the level. Baskets and discs will be lit after the sun sets, and volunteer caddies will run with him for an hour at a time. He has also been in touch with Guinness, and plans to submit his feat for world record approval based on a litany of evidence, from photos and scores to the witness work of a notary or police officer. As a result, the more bodies Sale can round up to pitch in at the event, the better. One of those two people will be teammate Mike Schnell, a fourth-year communication major who will coordinate the event while Sale plays. Schnell said that Sale’s dedication to the team, and the event, has been clear from the start. “The team was his idea, and he is showing tremendous commitment to both the record and raising funds for our trip to nationals,” Schnell said. And, for those worried about Sale’s conditioning for such an endeavor, have no fear. The mental aspect of the feat, though, can also be daunting. That is where the current Guinness world record holder has offered his advice. Schnabel has held the record since June of 2011, when he completed 1,305 holes in 24 hours at Voyageur Park in Pine City, Minnesota. This is his second time holding the record, but he had no problem lending his support for Sale’s effort. Schnabel’s first run as the record holder came in 2010, when he played 1,035 holes. Schnell, for what it’s worth, said he is confident that Sale will be the one to hold the new record. And even in the wee hours of the night, when fatigue sets in and Sale begins to worry more about his biggest fear (turning an ankle), he said he will rely on his focus to pull him through. Update: According to a post on DGCourseReview.com, Sale said he broke the record by playing 1,310 holes. Thanks for sharing this piece with us… This is a very cool way for Sale to raise money for his club as well as Disc Golf Awareness. This is cool to hear. I played in the NCDGC last year and played with some UCSB players. I hope my team will be there to compete against him in April! So do we know how it went? I’m his little brother and he broke the record with 1310!